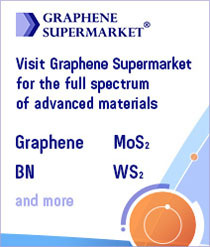 We have investigated electrical transport and shot noise in graphene field effect devices. In large width over length ratio W/L graphene strips, we have measured shot noise at low frequency (f = 600–850 MHz) in the temperature range of 4.2–30 K. We observe a minimum conductivity of 4e2 h and a finite and gate dependent Fano factor reaching the universal value of 1/3 at the Dirac point, i.e. where the density of states vanishes. These findings are in good agreement with the theory describing that transport at the Dirac point should occur via evanescent waves in perfect graphene samples with large W/L. Moreover, we show and discuss how disorder and non-parallel leads affect both conductivity and shot noise. We propose a way of producing and detecting pseudospin entanglement between electrons and holes in graphene. 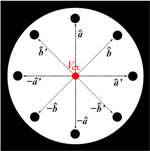 Electron-hole pairs are produced by a fluctuating potential and their entanglement is demonstrated by a current correlation measurement. The chirality of electrons in graphene facilitates a well-controlled Bell test with (pseudo-)spin projection angles defined in real space. Electric transport of a zigzag graphene nanoribbon through a step-like potential or a barrier potential is investigated by using the recursive Green’s function method. In the case of the step-like potential, we demonstrate numerically that scattering processes obey a selection rule for the band indices when the number of zigzag chains is even; the electrons belonging to the “even” (“odd”) bands are scattered only into the even (odd) bands so that the parity of wavefunctions is preserved. The so-called valley-valve effect can be explained by this selection rule. In the case of the barrier potential, by tuning the barrier height to be an appropriate value, we show that it can work as the “band-selective filter”, which transmits electrons selectively with respect to the indices of the bands to which the incident electrons belong. Finally, we suggest that this selection rule can be observed in the conductance by applying two barrier potentials. We have studied numerically the statistics for electronic states (level-spacings and participation ratios) from disordered graphene of finite size, described by the aspect ratio W/L and various geometries, including finite or torroidal, chiral or achiral carbon nanotubes. 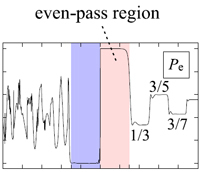 Quantum chaotic Wigner energy level-spacing distribution is found for weak disorder, even infinitesimally small disorder for wide and short samples (W/L >> 1), while for strong disorder Anderson localization with Poisson level-statistics always sets in. Although pure graphene near the Dirac point corresponds to integrable ballistic statistics chaotic diffusive behavior is more common for realistic samples..